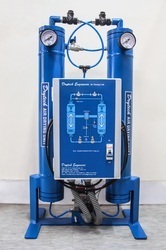 Offered by us is a wide and exclusive range of Compressed Air Dryer. These products are manufactured by our team of professionals, who make use of premium quality raw material which is obtained from authentic vendors of the industry. Furthermore, we make these dryers available to the customers in varied sizes and specifications, at industry leading prices. In addition to this, our range is widely appreciated by the clients for its durable standards, functional efficiency and high performance.